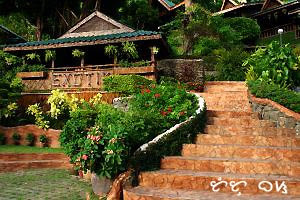 A nice restaurant in a garden setting nestled on the slopes of the Sierra Madre mountain range whose real name is Exotik Garden Restaurant, it has quaint Filipiniana-themed huts made from indigenous materials and wooden decorations reminiscent of Paete town, from where the owner is former mayor. 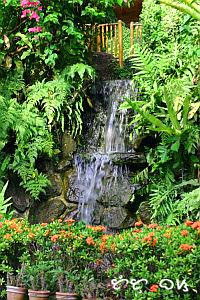 Actually located in Kalayaan town and not in Paete, like most people associate the place with, Exotik's resident python, Samantha, welcomes visitors to the place though it's sort of a turn-off to some who can't stand the sight of snakes and constrictors. 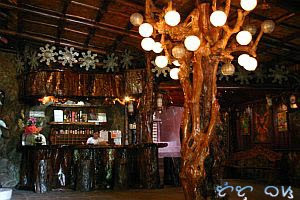 The menu is a combination of native Filipino dishes. The exotic fare, trimmed down to conform to laws on the protection of endangered and protected animals, used to include: bayawak (monitor lizard), baboy damo (wild boar), sawa (python), usa (deer), pating (sharks) and ostriches. Now, only ostrich and non-endangered animals appear on it similar to what used-to-be exotic Balaw-balaw Restaurant in Angono, Rizal once served. Price is mostly mid-range under P200 per dish. When Tutubi went there again, he ordered ginataang kuhol at pako (golden snails/escargot with coconut milk and fern), calamares (fried squid) washed down with SanMig Light. There are huts located quite high up the slope that offers a fascinating view of Laguna de Bay (laguna lake) facing west so the sunset is another sight to behold. Function rooms can be ideal venues for weddings, baptisms and other events. A souvenir shop sells various items and products of Laguna and Quezon province e.g. buco pie, various sweets, tsinelas from Liliw, woodcarvings from Paete, coin purses made of snake skin and dried toads et al. 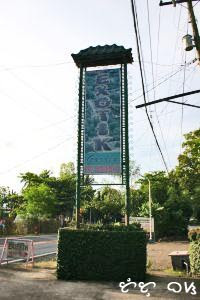 Exotik Restaurant is open up to 9pm everyday and located on the national highway near the northern tip of barrio Longos of Kalayaan, Laguna. There used to be branch near Caliraya Lake but it seems to have been closed down. by car: drive to Laguna up to Pagsanjan then left turn on approach of Pagsanjan church. The restaurant is a few meters from the 100 kilometer post so it's not easy to miss. u should get ad fees for this post. looks like a good place to eat. carlotta, oh no. do i really start to sound like one? ambience is nice nice indeed but the food needs to be improved if they intend to make it really big. Cool place. And I agree with photo cache... you should get paid for your posts! It looks very interesting. It looks like a beautiful temple. I love the quaint nature setting. Do people go to laguna back and forth for this or should we plan for an overnight thing? A pretty decent place to dine! ruy, depends on you. there's a resort across the highway from Exotik Restaurant where you can stay. Laguna can't be explored in a day. I toured my friends twice and we can't cover it all in two days even with the past pace we did it. Laguna, however, is a nice daytrip destination outside Manila. hmm....looks likes a nice resto to eat in. and how is the food?.im a pinoy but im working outside the country as a chef here in spain. but what catches my attention most is "samantha" the burmese python in the resto(ive seen a video of the python on youtube). 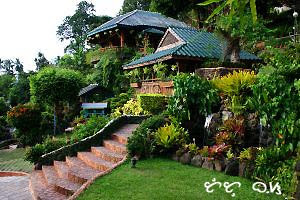 by the way im a chef and a reptile collector at the same time.ill be having my vacation this september2009 and for sure ill visit this exotic resto, for the food to taste and to see samatha personally. got lots of question about this beautiful creature. and im sure she got a caretaker to ask with.have a good day po!!! we've been there.. a really nice place.. it was closed though coz it was "Good Friday"
what is the history of your restaurant? Been there yesterday and I must say, the food we ordered really tasted great (except for the very salty beef steak). Only thing is, the only "exotic" food available in the menu is shark meat. Everything else is pretty normal. I am a probinsyano so I consider kuhol and suso as normal food. Hehe. The waiters said that there used to be many other exotic dishes but they were reprimanded by environmentalists for serving endangered animal meat. They were even sued! So they had to cut the menu in half (not literallt ofcourse). As for the foreign dishes, they said that most customers come there just for the ambience and really not to eat exotic dishes, as many of them could not even bear the thought of eating shark for example, so they added more "mainstream" dishes. There is now a swimming pool and a couples of rooms to stay in for overnight trips.